Home|Floral Library|Swedish Ivy – Plectranthus spp. 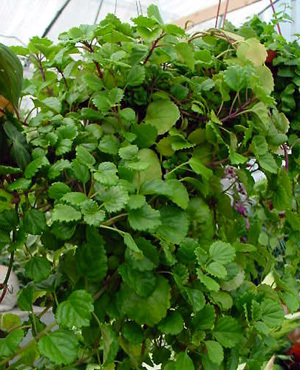 Swedish Ivy – Plectranthus spp. Decorative Life: Many months but seldom for years under typical interior environments. Slightly sensitive to chlorinated water as chlorine levels above about 40 ppm can cause damage. Chill sensitive, hold at 55F or higher. From the Greek “plectron” meaning spur and “anthos” for flower. The corolla (petals) often have a basal spur. In an earlier (1978) study, Harbaugh et al. showed that this species could be sealed in a polyethylene package and still be marketable when held at room temperature after 60 days.